This is the third article in our leadership consulting series of articles that looks at creating transformative change in your organization. The full series will be available for download as a white paper once it is completed. In our last article, we discussed the importance of leaders understanding the need to change first before an organization can experience transformative change. Now let’s discuss the how to alter your approach as a leader to create organizational change. In my experience as a leadership expert, it is clear that advocating for change internally and communicating the need for your team to alter the way they do things is extremely difficult if leaders first do not make noticeable changes themselves. Actions speak louder than words, and this is particularly the case when it comes to organizational change. You first need to change how you lead before the organization will follow your call for change. For example, communicating a need to cut spending and reel in budgets is difficult to argue if leaders make no observable change to cut spending at the executive level. However, when leaders frame change in the right way and take actions to support change, it will be embraced by management and team members at all levels in the organization, allowing transformative change to take place. What kind of team do you want to put together? What are the team members’ individual strengths and how do they complement each other? How many people? 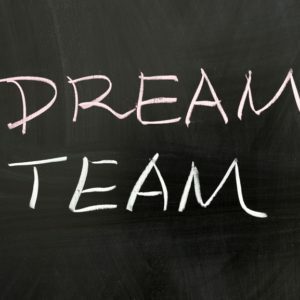 What is the role of the team? How will this team help you address personal and organizational change? Which individuals internally do you see as a good fit for the team? Leaders first need to understand the concept, role, and scope of their leadership team before adding members. It is not uncommon for the search for a leadership team to expand outside the organization. Adding someone from outside the organization brings new insights, perspectives, and opinions without the bias of being part of the organization or being tied to previous strategies. Most leaders already have a good idea of which internal people would be good choices to add to a team. Some are people that you consult regularly while others are people that deliver results consistently and are looking for new challenges. Words of caution—avoid the trap of making your leadership team a group of “yes men”. This inhibits your ability to make real change to the organization culture and how things are done. A leadership team is ineffective if you do not give each member of the team a voice and they are unwilling to challenge each other in a positive manner. Healthy disagreement and discussion is essential to developing innovative solutions to long standing issues. Surrounding yourself with people who are willing to offer new ideas and examine things from a unique perspective will help you achieve real change. You can work around this potential issue by assessing each potential leadership member’s fit within the new culture you are looking to develop. You need people who also have a desire and willingness to grow, are self-aware of their need to change, and realize the need for change within the organization. A strong leadership team has a significant impact on your own ability to change as a leader and implement real change within your organization. Don’t overlook the importance of having a strong leadership team to support your desire for organizational change. The next article in our leadership consulting series will examine the key moments of change that allow for transformative change to occur.